How to make Paint Your Own Cookies with Stamps! Paint Your Own Cookies are great for parties, teacher gifts, gifts for neighbors or really anytime! Who wouldn’t want to paint their own cookie and then eat it! But, people can be intimidated to make them if they aren’t a professional cookie decorator. But, with a few simple changes you can make them quickly and easily. Most paint your own cookies are: cookies with a background of royal icing, with the design stenciled on. And this is great, but they can take a long time and for people that aren’t used to stenciling it can be difficult. Here is a quick and easy way to make Paint your own Cookies! Here are the changes you need: instead of using royal icing I use a mix of modeling chocolate and fondant. And I either stamp or stencil my design on the modeling chocolate fondant mix. Here are the reasons I do that. With the modeling chocolate/fondant mix you don’t have to wait hours for the background to harden. I just wait about 1/2 hour to let them set up a little, then they are ready to use. 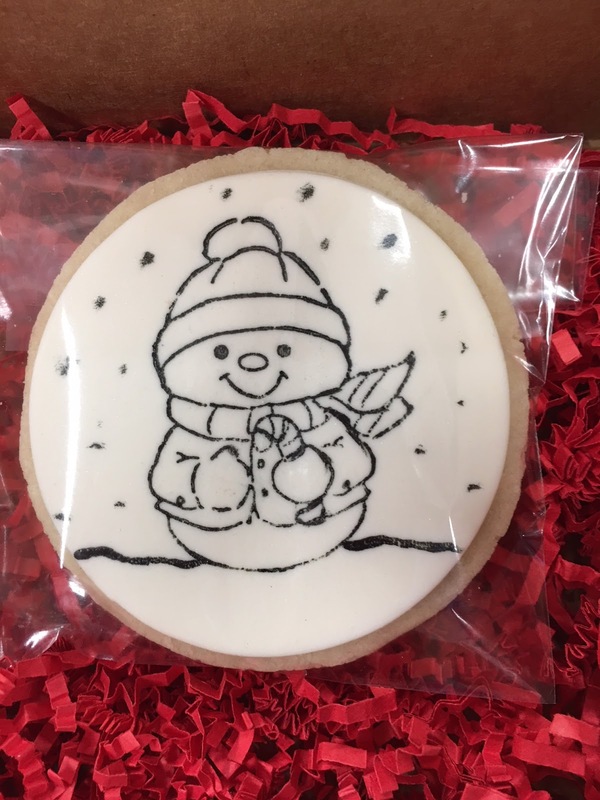 So by the time you cut out all your circles, have your cookies ready, and get your supplies to stamp on the images they are pretty much ready for you! Then all you have to do is wait about an hour to make sure the food coloring is dry to package them! Below is a link and a video I posted on YouTube showing how to make them. You can go to You Tube here. Here are the things that you need to stamp your own cookie. *A brand new stamp that has not been used with ink. I prefer the clear stamps, but regular stamps work just fine as well. It is just easier if you can see through your stamps to see where you are placing them. * Food coloring Gel (I use Americolor) with a dish to hold it. * Fondant or modeling chocolate or a mixture of the two. * A paint brush to touch it up or add a little to the design. When applying the color to the stamp try not to get the sides and just the part of the stamp that you want stamped. And make sure you have enough food coloring on the stamp before you stamp it since you only get one shot to do the design correctly (it is almost impossible to stamp it twice even with a clear stamp). When you stamp go straight down and make sure all of it is pressed down to give a good stamp. Then attach your fondant to the cookie with either a little piping gel or melted chocolate or royal icing. Make your “paint palate” cookie and you are done! Package them up after about an hour to make sure the food coloring has dried. Let me know if you have any questions, and send me pictures of your paint your own cookies! Next Next post: How to get Perfectly Straight Sides on your Cookies! Round, Square, or any shape!